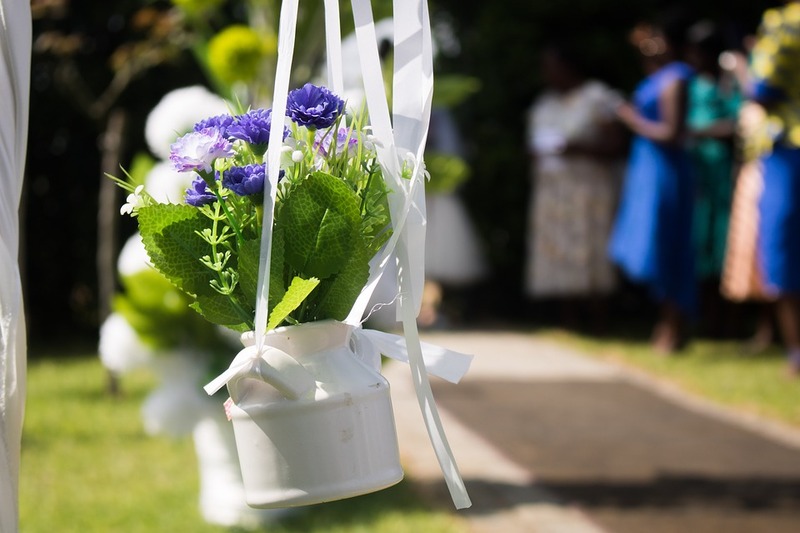 Wedding flowers are not only for the bride but can be used for other things. Here are 5 ways to use flowers that aren't just centerpieces and bouquets. Some things are synonymous with weddings: flowing white gowns, the music of Ed Sheeran, and big bundles of colorful flowers. Most couples make sure to have flowers on every table and in the bride’s (and bridesmaids’) hands, but is that really all they’re good for? Of course not! You can use flowers to add an ethereal, earthy vibe to any part of your special day. A photo booth or photo wall is a wonderful way to get your guests excited about your wedding — after all, who doesn’t love a good selfie? But most rental photo booths have one major problem: they’re designed to be as plain as can be! You can bring some fresh new life (literally) into your photo backdrops by buying, renting, or making (if you love a good DIY project) a flower wall in your wedding colors. You can also buy a printed floral wall online. 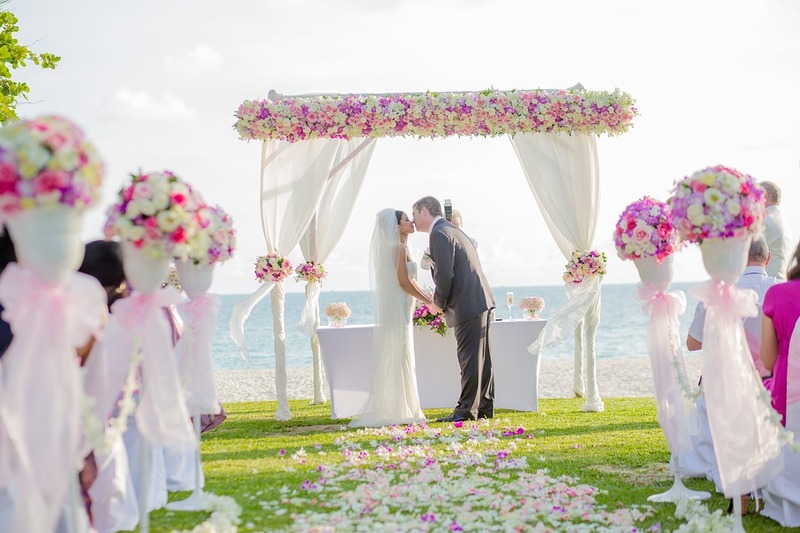 Most couples want their wedding day to feel like a fantasy come to life. Well trust me, nothing is more fanciful or romantic than an aisle beautifully lined by your favorite hanging florals. You can even create a truly magical reception atmosphere by hanging bunches of flowers from the light fixtures on the ceiling — but ask your venue first, of course. All those flowers hanging down is bound to awe every one of your guests. Signature drinks have been a popular idea among newlyweds for quite some time now. Creating a drink with your favorite flavors and sharing it with all your guests can be a lot of fun (especially if you give it a cute and clever name). If you really want to tie in your signature cocktail with your wedding, garnish it with an edible flower that matches your theme. It’s an elegant way to dress up your drink! Similarly, you can top your wedding cake with florals or scatter them on the cake table for added gorgeousness. Apart from the bouquets and centerpieces, the aisle is the one place where flowers rule at a traditional wedding. Typically, a cute little flower girl will come walking down the aisle, throwing petals down for the bride to walk upon. But if you ask me, you should up the floral ante! Instead of a cloth aisle with a few scattered petals, why not make the entire aisle out of your favorite buds? There’s nothing like a petal blanketed aisle to really add drama to your grand entrance — but keep the flower girl for good measure (your niece is really excited about it). Another popular way to use flowers on your wedding day is the gold old-fashioned flower crown. 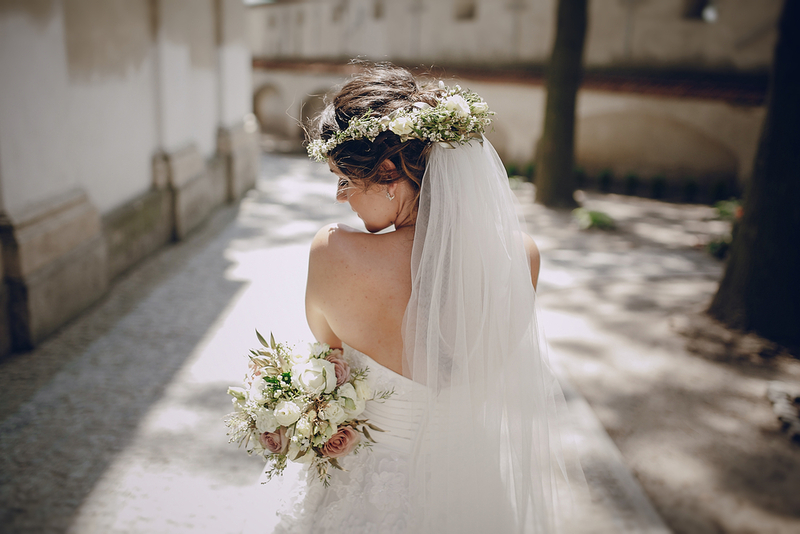 Everyone from Earth-goddess brides to cherubic flowers girls are sporting this sweet style — and if you ask me, it’s time to let Fido get in on it! If your dog is taking part in your wedding ceremony (and these days, many dogs are), why not get him all spruced up with a flower collar of his very own? This simple accessory will make him a hit with everyone he meets! Flowers are an excellent way to add elegance, romance, and color to your wedding day. Don’t be afraid to get creative with your florals. There’s no right or wrong way to use them!